More hand on bar means a safer ride (click to enlarge). 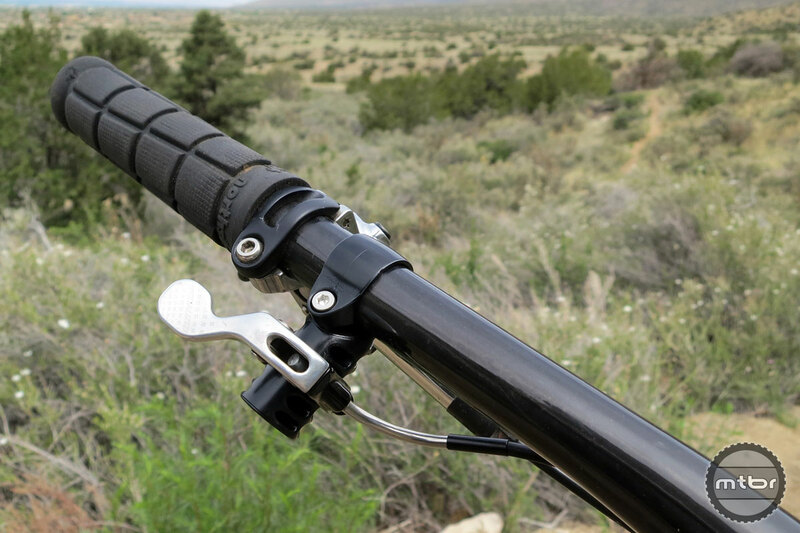 If you’re like us, you love your dropper post, but are just ho-hum about its actuation lever. Most require some sort of compromise. They’re often out of easy reach, requiring the user to move the thumb in odd ways and loosen the grip on the bars in the process. That can be a bad thing if you happen to be barreling through a rowdy rock garden. 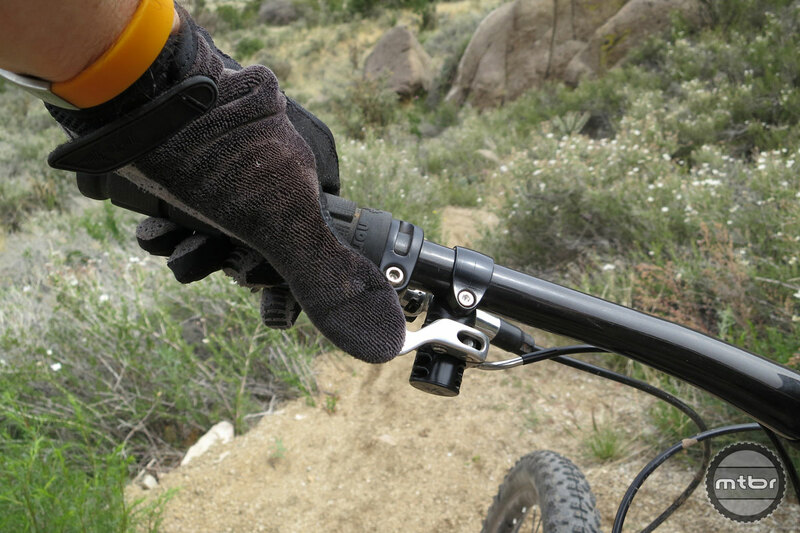 Enter the new Lindarets ReMount, a novel little device that claims to provide more flexibility as to where and how you engage your dropper post’s lever, especially if you’re running a 1x drivetrain. 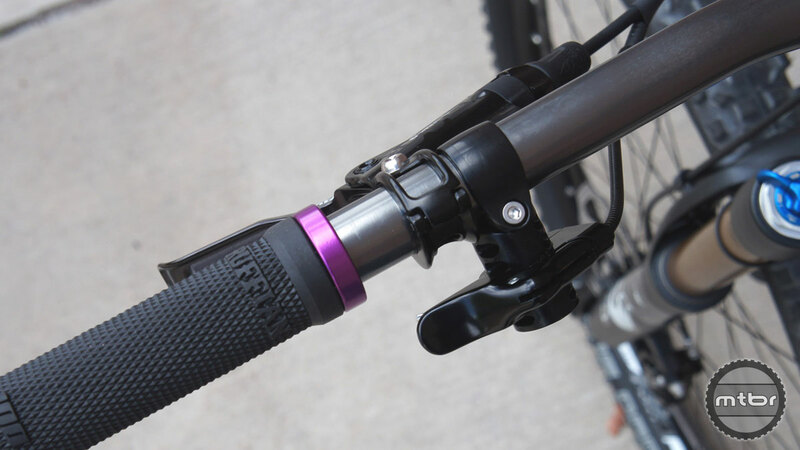 The ReMount allows most cable-actuated dropper remotes to be turned on their side, which moves the lever from inboard of the brake lever to roughly where a front shifter’s thumb paddle would normally sit. 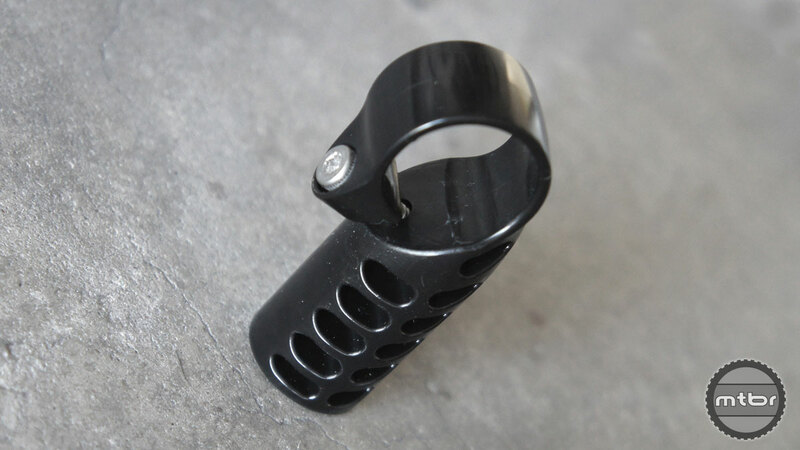 The device’s 30mm length then allows the rider manipulate position to a place that best suits body and bike. And that means you can keep more hand on bar when dropping and raising your saddle. Looks great with a Specialized Command Post lever (click to enlarge). One unfortunate drawback is compatibility. 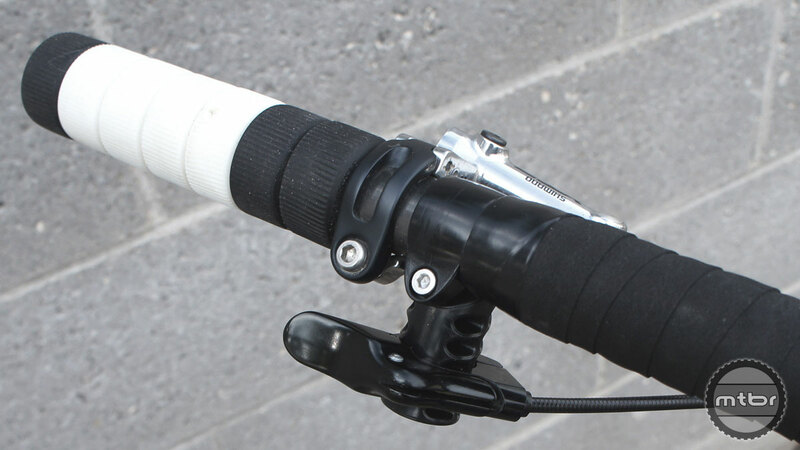 The ReMount mounts securely to all standard mountain bike handlebars, and is designed to work with cable-actuated dropper and shock remotes with pivots parallel to the handlebar center. That’s good news for folks who use dropper posts made by Specialized, KS and Thomson. 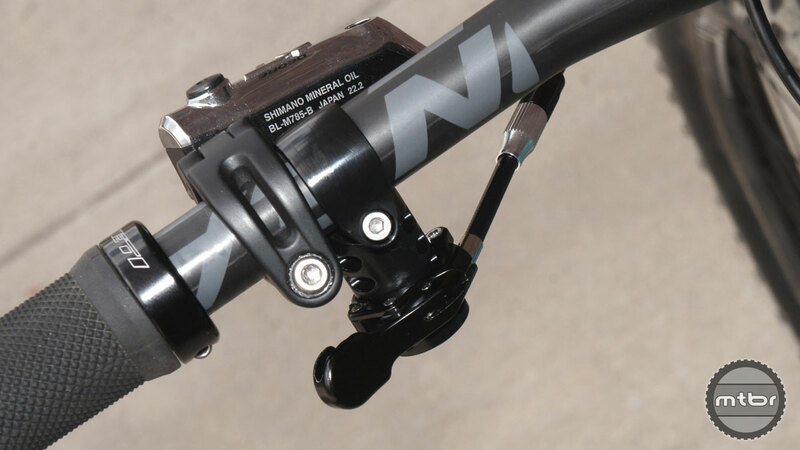 But of little use to anyone rocking a RockShox Reverb or other posts with similar push button mechanisms. Installation of the ReMount is fairly straight forward, according to Lindarets. Remove your current remote and set aside. Remove the M4 screw from ReMount and snap it over the bar. They recommend placing it inboard of the brake lever, with the screw head facing the rider. Friction/assembly paste is also recommended. Add a dab of grease to the end of the ReMount screw. Weight is 20 grams. Cost is $19 (click to enlarge). Now reinstall the M4 screw, tightening only enough to prevent free movement. Install the remote over ReMount and tighten hardware only enough to prevent free movement. Then move the ReMount and remote until remote lever is in comfortable position. 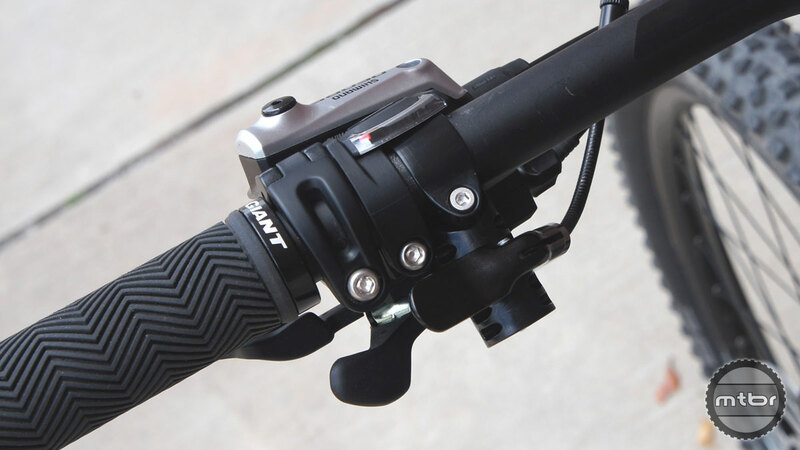 Lindarets advises to start lower on the mount than higher, and to compare the ReMount to a rear shifter thumb paddle. Finally tighten the ReMount M4 screw to 3-4Nm. Tighten remote mount only enough to prevent movement in normal use. This will reduce the potential for damage in a crash. 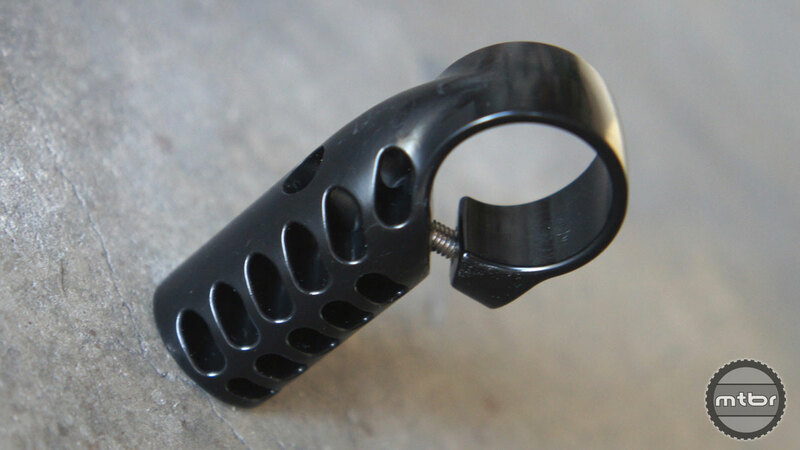 The ReMount is made in the USA of chemical-resistant Delrin, which Lindarets claims reduces the chance of handlebar damage if you do stack it. Claimed weight is 20 grams. Cost is $19. Here is the ReMount with a Thomson Covert lever. Looks great with a Specialized Command Post lever. More hand on bar means a safer ride. Weight is 20 grams. Cost is $19. It’s made in the USA of chemical-resistant Delrin, which Lindarets claims reduces the chance of handlebar damage in the event of a crash. It can even work with 2×10 set-ups. This is the Giant Contact lever. Puts the lever where you can actually get to it without unwrapping from the bars. this would be good for hydraulic actuated, but for cable actuated, just modify your left shifter to not ratchet, voila, perfect position.